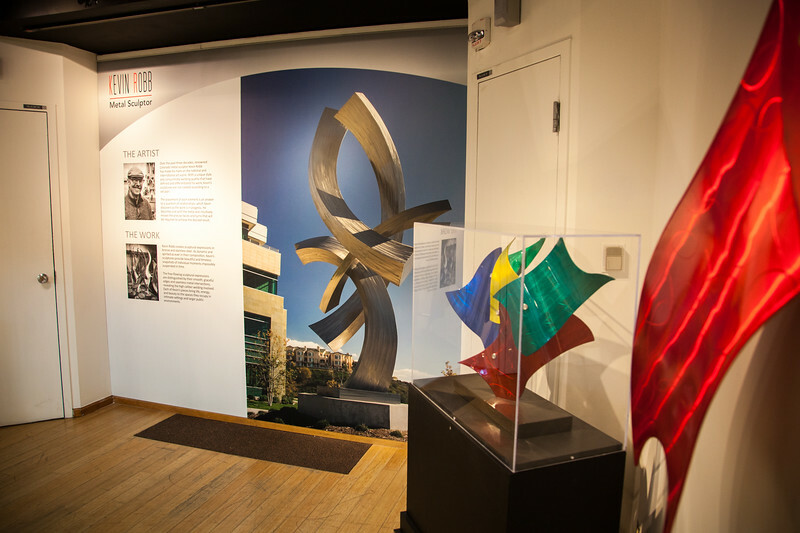 “Kevin Robb, Metal Sculptor” features large photographic wall murals that impart the monumental scale of Robb’s public art pieces while his smaller more intimate works are featured throughout the gallery. In addition to his artworks, the exhibit also includes Robb’s personal story about a life-altering stroke in 2004 that left him disabled but details his remarkable artistic journey since then. Kevin Robb’s dynamic, free-flowing sculptures are like moments suspended in time with their seamless metal intersections and graceful edges that help evoke his determination and life sustaining passion. Over the past three decades, renowned Colorado metal sculptor Kevin Robb has made his mark on the national and international art scene. Robb creates sculptural expressions in bronze and stainless steel that are spirited in their composition. Each of Robb’s pieces bring life, energy and beauty to the spaces they occupy in intimate settings and larger public environments.